Donald Bitzer (BS '55, MS '56, PhD '60), H. Gene Slottow (PhD '64), and Robert Willson (PhD '66) received an Emmy Award from the National Academy of Television Arts and Sciences. They received the prestigious award for inventing the flat-panel plasma display, the forerunner of today's high-definition flat-panel television monitors. In early October, three University of Illinois Electrical & Computer Engineering (ECE) alumni received an Emmy Award from the National Academy of Television Arts and Sciences. 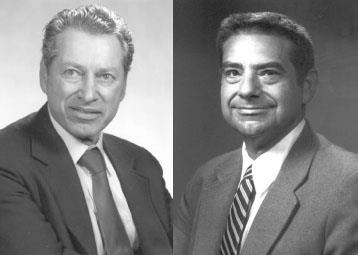 Donald Bitzer (BS ’55, MS ’56, PhD ’60), H. Gene Slottow (PhD ’64), and Robert Willson (PhD ’66) received the prestigious award for inventing the flat-panel plasma display, the forerunner of today’s high-definition flat-panel television monitors. They shared the 2002 Scientific and Technological Emmy with Fujitsu General America, Inc., which played a lead role in commercializing the technology. The flat-panel plasma monitor invention was a spin-off of work that ECE and Coordinated Science Lab faculty were doing on the University of Illinois’ famed PLATO system, noted Tim Trick, an ECE professor and former department head. PLATO, or Programmed Logic for Automatic Teaching Operations, had the distinction of also being a “first.” It was the first computer-assisted instructional program in the world. In a 1999 article in Information Display, Bitzer wrote, “One of the important requirements of the PLATO system was a display that would support graphics with superimposed picture images.”1 The technology of the time did not allow this, so in 1963 he assigned graduate student Willson the task of exploring one possible solution to the problem. About a year later, he and Slottow found themselves together waiting for their wives to pick them up after work, and they began discussing Willson’s results. “Both wives were late in arriving, so we began a discussion focused on reducing the early work to as simple a configuration as possible, utilizing the natural capacitance characteristics of a glass panel. . . . Our wives still think that they and their tardy arrival deserve part of the credit for the invention." What they devised was an electronic display in which each pixel (dot) on the screen glows like a little neon sign. The plasma panel is both a display and a storage device. Once a pixel is lit, it stays lit until the person at the terminal requests new information from the computer. The memory inherent within the plasma display, a characteristic which cathode ray tube (CRT) displays lack as they must constantly refresh, allowed the PLATO system to function without relying on the expensive magnetic memory technology of the day. The plasma monitor accepted digital information directly from the computer and stored it on the panel, solving the scalability problem that plagued the use of cathode ray tubes in computer display monitors, said Trick. Initially, the plasma monitor was available in a single color and was marketed for commercial and military applications, where a rugged, monochrome, flat-panel display was needed. For instance, the Department of Defense used one plasma display in a number of Navy programs, including instrumentation for the Trident submarine. Today, consumers are buying large-screen flat panel televisions that hang on the wall, and Bitzer, Slottow, and Willson’s creation has enabled large screen High Definition TV and DVD technologies. Professor Bitzer left the University of Illinois in the 1980s to become a Distinguished University Research Professor at North Carolina State University in Raleigh. Professor Slottow died in 1989, three years after retiring from the Illinois ECE faculty. Dr. Willson is an engineer with Analex Corporation of Alexandria, Virginia. Bitzer and Willson were on hand to accept the Emmy October 2 at the National Academy of Television Arts & Sciences ceremony in New York City. ECE Head Richard Blahut presented Professor Slottow's Emmy to his widow, Mrs. Irene Slottow, in a ceremony on October 23 in Urbana, IL. The percentage of students who chose employment in Illinois immediately after graduation in 2016-17. Other top destinations are California (23.7%) and Washington (12.4%).